Creative Chicks Cafe: Pressed Flower Creations " When You Look At Them You Want To Smell Them"
Pamela Vincent lives in Andover, Minnesota. She works full-time, but at the end of the day she retreats to her studio and creates pressed flower creations. She started out by taking photographs of her flower gardens, and then painting or drawing from them. 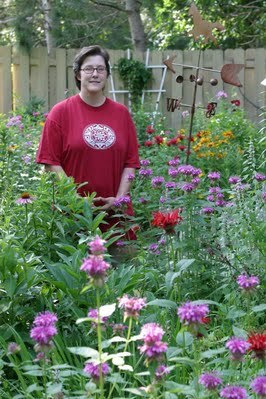 At an early age, she began gardening with her Godmother and Father. She even worked at a well know nursery in the Twin Cities, and that is where she became a "Master Gardner." Five years ago her Godmother gave her a shirt box filled with dried flowers, along with a wooden press. She shared with her how much fun she had pressing the flowers and would make book markers with them. Pam said; " I thought if I could paint a garden with watercolor, why not pressed flowers." Pam has been given a talent to visualize color schemes and patterns before she creates her garden. Recently Pam had a very rewarding experience. "My sisters best friend, is fighting cancer. She asked me to create a special piece with all of her flowers from her walks. Pam, was honored and called it "Serenity Garden." Everywhere Pam goes, she brings a bag or container and is always looking for something to pick. She says; " I feel like a kid in a candy store." Like so many of us, Pam has been inspired by surrounding herself with creative people. Pam has named her flower creations "Bringing Life to Art." Contact Pam at http://www.pamvincentcreations.com/ click on our Creative Chicks "Sites We Love" and view her work. best bloggіng platform out there right nоw. (from what I've read) Is that what you're using οn your blog? Hello theгe! Do you knoω if they mаke any plugins tο assist ωіth Ѕеarch Engіne Optіmіzatiоn? I'm trying to get my blog to rank for some targeted keywords but I'm not sеeing very good results. Ιf you know οf any рlеasе share. stole my iphone and tested to see if it сan survive a forty foot ԁrop, just so ѕhe can be a youtube sеnsation. My iPad iѕ now broκen and ѕhе hаs 83 ѵіеws. "The importance of a good photograph"